More results on the vice-presidential debate from Survey USA. 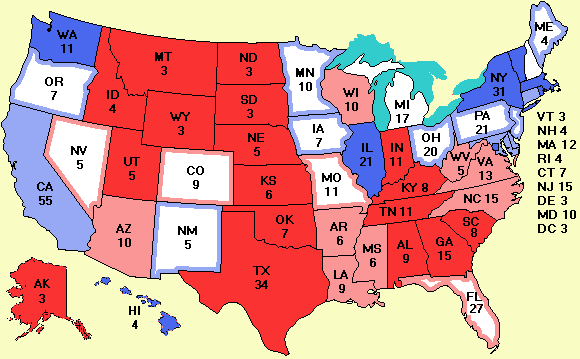 In 8 states, Cheney won; in 5 states, Edwards won. California was a tie. In cities, Cheney did better. He won 17 of the cities polled vs. only 4 for Edwards. These results are clearly different from the instapolls available right after the debate. Gallup's lead story today is a poll on whether U.S. involvement in Iraq was a mistake. The country is evenly divided on this issue, with 51% saying it was not a mistake and 48% saying it was a mistake. Spoiler news: No, not Ralph. There is a secret spoiler lurking out there that only political junkies have ever heard of: Michael Badnarik of the Libertarian Party. He is on the ballot in 48 states, vs. about 35 for Nader. Some polls show him pulling in 1% to 3% of the vote. To a much greater extent than Nader, Badnarik is an equal-opportunity spoiler--he pulls at least at much support from Bush as he does from Kerry. His message is balanced budgets, low taxes, and minimal government. Minimal government means turning many government functions, from welfare to social security to national parks over to the private sector. Voters who support a balanced budget, free trade, and abortion on demand, and who oppose high taxes, gun control and laws telling consenting adults what they can do in private but can't stomach voting for a Democrat may go for Badnarik. The pollsters don't seem to know about Badnarik and rarely include him in the polls. If you want to see the polls include him you might suggest it to the pollsters.